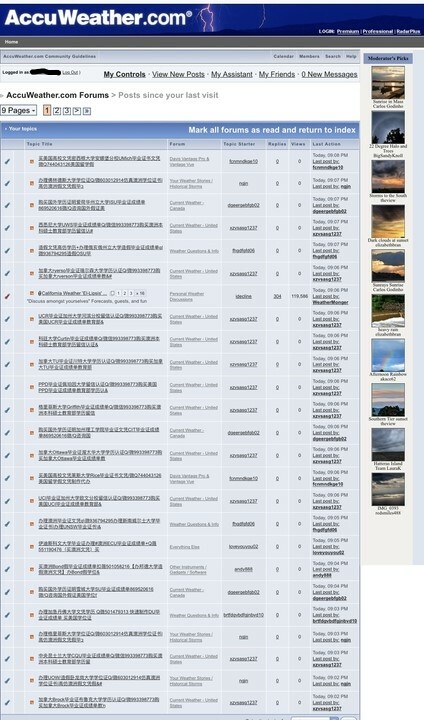 Yesterday, the Accuweather Forums were hit by a coordinated spam attack. Even though this spam attack was "a typical" one that the forums have dealt with over the years, it comes on the heels of an agreement with Cantor Futures Exchange, L.P. to basically "save" the forums. Why on earth would this be needed might you ask? The legacy hardware ran utilized by Accuweather reached the end of it's service life years ago. The powers that be decided that, despite a membership of 14,208, they would not upgrade it. They claimed it would take too much money to implement. Earlier this year, the founder of the forums posted a topic stating that the forums would be closing. So, the members leaped into action, afraid that our community would be lost in the web and forced to join other forums that have had a history of being hostile towards us. A member of the forum quickly developed his own weather forum based off of new hardware and software despite Accuweather claiming that it took too much money. This forum is located at https://wxdisco.com/forums. The higher ups saw a mass exodus from the forums and had the founder remove the closing topic and anything related to pointing members to our new found home. It saddens me to see it come to this. In late November of 2008, I was approached by the core group of Northeast/Mid-Atlantic moderators to become the only moderator for the Plains/Midwest/Ohio Valley threads. 10 years of being a moderator on one of the most popular weather forums was an experience to say the least. Trivial things like them not following the guidelines that they signed would produce a moderation period to make sure that they stopped the style of posting, or be banned for continuing. Multiple times during those 10 years I received messages from those said people where they threatened to come after my family, attack my integrity, & be called every name in the book. If you ask my ex-wife, she would tell you that my dedication to this forum was part of our demise. During the winter, there were multiple times that we had over 1,000 members discussing a major Nor'easter impacting the region. These periods would require me to tend to members "reporting" each other for post that didn't follow our guidelines. I can remember multiple occasions that I would spend a week answering the said reports and making sure that the threads were a well oiled machine. The dedication of the forum founder, 'weathermatrix', and our team of supermoderators, are a mere afterthought in the eyes of the management. They have sold the forums to the devil and, instead of encouraging discussion about the weather, encourage gambling on the weather. Yes...the forums are still alive and we can look at the historical threads and remember the relationships that have developed from them. To this day, I have friends on Facebook and Twitter who I'm in consistent contact with. Finally...I do not fault the founder of the forums one bit. He was stuck between a rock and a hard place with the management.